The 2019 recruiting cycle is all but in the books. Pending graduate transfers or traditional transfers, there will be no more additions to the OSU roster past Wednesday, the official National Signing Day across the country. Most of OSU’s pawns are set to this point, with 20 opting to sign in the early period. But there are a few pieces left out there that could fall in OSU’s favor on signing day — or in the days leading up to the summer. Here is what to watch over the next 24-48 hours. Oklahoma State made an interesting move last week when it offered Broken Arrow linebacker Gavin Potter. Potter is committed to Kansas State, and to this point, there’s no reason to think he’s flipping. But … 1. He is from Oklahoma and 2. He made an official visit to Texas Tech over the weekend. That would seemingly indicate he hasn’t closed the book on his recruitment altogether. With Patrick Macon transferring, and OSU losing a linebacker commitment this past week, Potter makes a lot of sense as a late take at linebacker given the sudden need to bolster the depth at the spot. Will he consider OSU? Junior college defensive end Soni Fonua spurned OSU for LSU this past week, a stunner that leaves the staff in a bit of a bind. OSU needs experience to replace the outgoing production of Jordan Brailford, of Cole Walterscheid and of Jarrell Owens, all talented edge rushers who produced last season. So keep an eye on who might be a late target here. There isn’t a surefire name OSU is currently in on at this point, but a junior college prospect makes the most sense. Someone who the staff can plug and play right away is a major emphasis here. 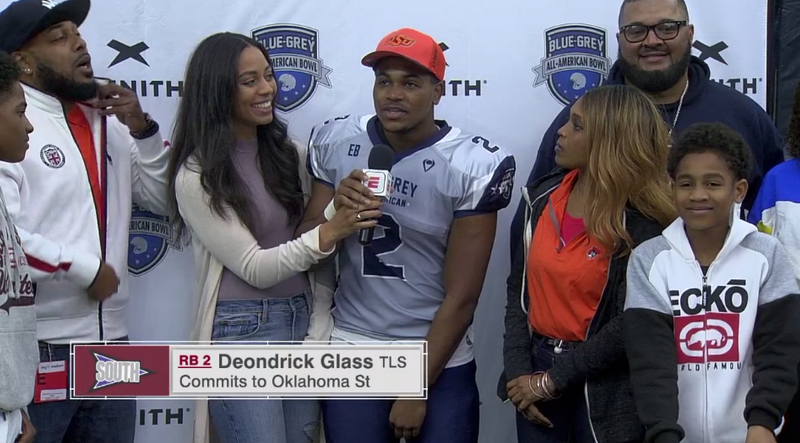 There is no reason to be concerned about the commitment status of four-star running back Deondrick Glass, OSU’s highest-ranked prospect in the 2019 cycle. But he remains the only recruit on OSU’s commitment list that has not signed, seeing as he committed two weeks ago to OSU in between signing cycles. There could always be thieves in the night looking to pry Glass away in the final hour, of course, but his own account of why he committed to OSU and his goals already set forth at OSU suggests he’s all Pokes. Still, there’s at least a very, very mild unease until he officially puts pen to paper and submits his NLI tomorrow. He’s expected to do so at his high school in Katy tomorrow.